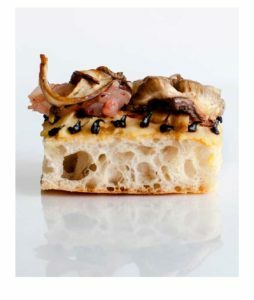 Google “best pizza in Rome” and Pizzarium will appear on your screen. We ate there in 2011 and loved it, but it became a Pavlovian response for my husband to mention it every time pizza came up in conversation. Frankly, it was starting to annoy me, and I wanted him to move on. 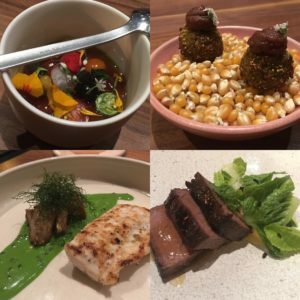 But then, days before heading to Chicago, we learn that its founder, Gabriele Bonci, has opened his first U.S. outpost in the West Loop area. There happens to be an empty spot on our dining itinerary, and thus the stars have aligned for a reunion with this unforgettable pizza. 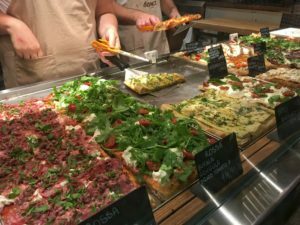 What makes Pizzarium in Rome and Bonci in Chicago so special? The pizza is “al taglio” style, which means it’s baked in large rectangular trays and sold by weight. Gleaming display cases showcase pizzas topped with generous slabs of meats, dollops of cheese, pinches of herbs, and layers of thinly sliced vegetables, paired in a variety of unique combinations. You determine the types and sizes of pizza that you want, and relay your decisions to the server behind the counter. They cut the pizza with scissors, weigh your selection, and charge you accordingly. You take a number and wait while your pizza is finished in the oven. If you’re lucky you can snag one of the few seats at the narrow counter. Chefs creating works of art with food is becoming commonplace. But pizza is not usually the canvas. Gabriele Bonci, however, is often referred to as the “Michelangelo of Pizza.” There is no question that his pizzas are visually stunning. But to create lasting memories, they also must have exceptional taste. Pizza can incorporate wonderful ingredients that are creatively intertwined, but they weigh down the crust, thus creating a soggy mess. Sometimes pizza has a crust that’s charred and crisp, but is topped with lackluster ingredients and flavorless sauce. We’ve all had our share of disappointing pizza. Bonci gets it right. The crust is crisp, but it’s also light and airy. My husband is scientific in his description of the crust, citing the open cell structure. Seasonality is a priority at Bonci, so there’s an ever-changing line-up. 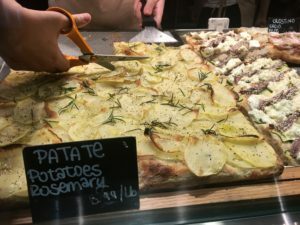 We ponder pizza with zucchini, ricotta and lemon peel; funghi with mozzarella, prosciutto, and arugula; cippolini with spinach and taleggio; spicy eggplant, and the irresistible crowd favorite of potato and rosemary. The beauty of Bonci is the ability to mix and match, so a large slice of one kind can accompany a smaller taste of another. Our visit to Bonci means that my husband can update his pizza story with fresh details. This may be something I eventually regret, but for now I treasure my own memories of this masterful artisan pizza. *If you visit Bonci, keep in mind there are just a handful of seats, so you may be forced to find somewhere else to enjoy your pizza. The menu is limited to pizza, but this means you can explore the restaurant-rich West Loop area to supplement your meal. We follow up Bonci with dessert and cocktails at Little Goat Diner, which is the casual-but-creative companion to the crazy popular Girl and the Goat from “Top Chef” Season 4 winner Stephanie Izard. 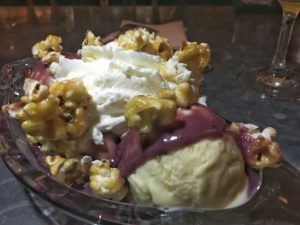 I highly recommend “It’s Kinda Corny,” a sweet concoction of sweet corn ice cream, blueberry sauce, and caramel corn. I have devoted an entire blog post to pizza, but we had two additional dinners that were absolutely stellar. “Bon Appetit” named Elske the #2 Best New Restaurant in America, 2017. Elske means love in Danish, which reflects the influences on the menu, and the married chefs Anna and David Posey. The $85 tasting menu features eight courses which include broccoli and amaranth fritter with spicy date jam; chilled zucchini and buttermilk cream with braised pistachio, blueberries, and elderflower; and roasted sturgeon with fried artichoke, preserved lemon, and lovage. 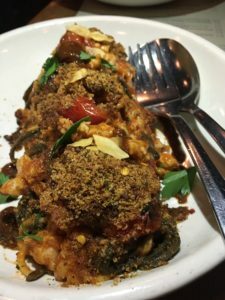 The food is innovative without being overwrought, and the atmosphere is low key and friendly. We loved Elske. Chef Sarah Grueneberg, a highly respected “Top Chef” alum, makes her mark in Chicago’s West Loop at the very hot Monteverde. The Italian restaurant is a mix of traditional and creative, with pasta taking center stage. Do not miss wok-fried arrabiata with black and white tagliolini, ground Texas gulf shrimp, and garlic hot pepper oil.